As we headed into week 4, I was starting to feel really positive about Dahlia’s prognosis. The vet had assured me that most dogs make a near-complete recovery and as long as the dog is showing improvement after those first crucial 72 hours, they are likely to continue improving. This was certainly what we’d seen with Dahlia! She had conquered the stairs to the outside. She was able to get around the lower floor of our house with no real issues. She was happy going on walks and doing a bit of play with Ben in the backyard. But she was not still at 100%. And we were all too well aware of that. Her head was still tilted, though it had become less extreme. She still had not attempted the stairs to our second floor. I was still sleeping in the downstairs guest room with her. And she had not been in a car since Christmas. We were very careful with Dahlia through her convalescence. 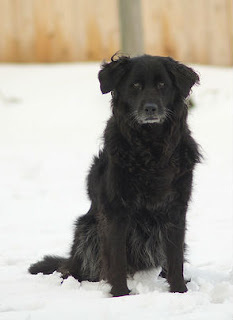 She is a dog who came to us with very little confidence and while she had gained so much during her 7+ years with us, Vestibular Disease shook her rather seriously. And so we did not want to try to get her upstairs or into the car before she was really ready to do it. Maybe we were too conservative. Maybe others would have pushed the issue earlier. But I think we ultimately made the right choice for her. It was the middle of the 4th week after this whole thing began, that Dahlia tried the stairs to the second floor. I still remember it clearly. Ben raced up the stairs as he usually does (Ben does nothing slowly!) and I went upstairs to find him a treat for bed. When I turned around, Dahlia was starting up the stairs. I absolutely panicked. My plan for getting her up the stairs consisted of one person being at the top of the stairs tempting her with treats while the other person stayed directly behind her in case she got wobbly and fell. 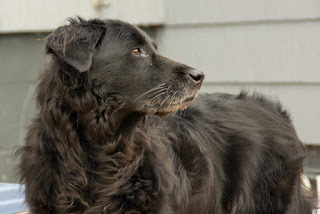 Because Dahlia is a stubborn dog who does things on her own terms, she just decided to do it with no one behind her in case things went badly. I rushed down and got behind her just as she got a little wobbly and stopped. She didn’t fall, thankfully. But it was clear at that point she wasn’t ready to continue. I managed to get her to turn around and walk slowly (one step at a time) back down the stairs. It was scary. She didn’t get all the way up. But she did it. On her own with no coaxing. Dahlia wanted to get better and so she simply did. It was sometime during the following week that we decided to work more on getting her upstairs. We knew she had it in her and so we gave her a few more days to sleep downstairs and then decided to see if she could do it. She was hesitant and afraid to start up them. Her first experience did not go all that well and she had lost some confidence. So we put her on leash and got out the big guns. The “big guns,” of course, were the treats I used in her agility classes: Hormel dried beef. She loves that stuff. And so we got it out, waved it under her nose, got her really excited and after a bit of hemming and hawing, a bit of wobbling around, she did it. Once she got going, she just kept going (me in front of her tempting her with treats, my husband holding the leash and staying at her side to catch her if she fell) and she got to the top with no real problems. The next morning was, of course, the next big challenge: Getting her down the stairs. I went down stairs to get some more treats out of the refrigerator and was heading back to go upstairs to put the leash on her and help her down. And lo and behold, Dahlia was making her own way down the stairs. Slowly. One step at a time. But she did it. On her own steam, with no one having to coax her down. She knew she wanted those treats. And so she came down to get them. Ironically, I was pretty sure the down part would be much tougher than the up part. But Dahlia proved me wrong as she so often does. Day 34: Playing with Ben! 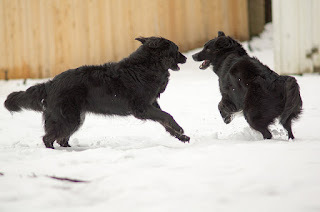 By the time weeks 5 and 6 rolled around, Dahlia was regularly racing into the backyard with Ben. She was still a bit wobbly at times and when Ben would do his trick of running 90 mph at her and leaping at her head, she’d fall over. But she got up quicker and would race off after him. Here’s a video shot on day 28 after this whole thing started. You might think the dog running at the camera at first is Ben, but you’re wrong! (And you’ll realize that when the second dog comes flying past the first one.) You can see how much she’s improved since the video I posted last week. 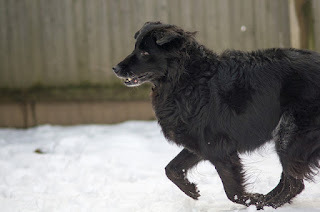 She’s much steadier on her feet and while she still struggles a bit and is a bit wobbly, she’s able to run at a pretty decent speed (especially considering she’s running on snow!). Nearly 8 weeks in: A straight head! By the end of week 6, she was regularly going up the stairs on her own. We were able to fade out the need for treats to coax her upstairs and every day it seemed like it was just that much easier for her to get started up them. She now goes up the stairs at just the mention of bed time. No treats, no coaxing, and no wobbling at all. And she races down them if she so much as senses someone might be going into the guest room closet (where we keep the treats). We also noticed that head tilt is almost completely gone. There’s still a bit of a tilt inside, but outside it has disappeared and inside it’s almost not noticeable. This does not happen for all dogs or cats (or, as I found out in doing some research many other animals: rabbits, sheep, cows, and other animals have been affected by this same disease). Some will always retain a small head tilt (and some quite a big head tilt — see Marnie the Dog) so if it doesn’t resolve itself for your dog or cat, don’t be too dismayed! Day 47: Finally in the car! This left one last thing to conquer for Dahlia: car rides. After Christmas (day 10 of this ordeal). she had not attempted getting into the car. I wanted to make sure she was confident enough to get into it. After seeing her try to get up on the couch and then decide not to do it again, I didn’t want to have the same issue with the car. When Dahlia started to attempt the couch again and got on it successfully, I decided it was time to see if she could do it. So one day, while my husband was out walking Ben, I grabbed some of her favorite treats and took her out to the car to see what happened. I opened up the doors to the car and turned to see if I could help her. But nope. Dahlia did not need any help. 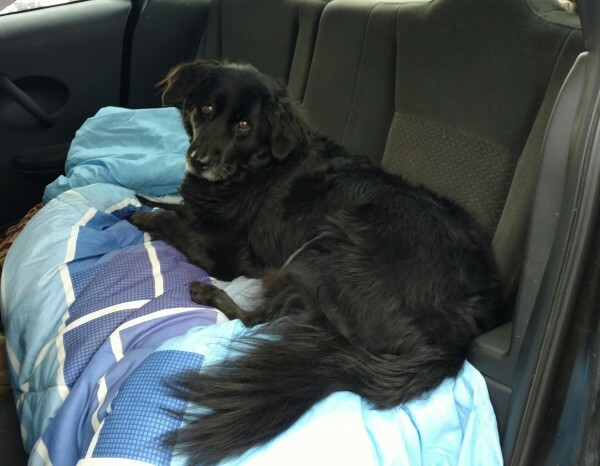 She leapt up into the car like she had never ever had Vestibular Disease. She also had no trouble getting out of the car, landing solidly on the ground without stumbling even a little bit. We went to Petco to celebrate. She got a lot of attention from the people she met there and a few delicious treats. This is where Dahlia is now. She has her old life back. She can go places with us. She can go upstairs and sleep on her bed at our side. She can run around the backyard with Ben. She gets steadier all the time with running, as you can see in the following videos, shot 7 weeks post-diagnosis. She is happy and healthy and sometimes it’s almost like this never happened. 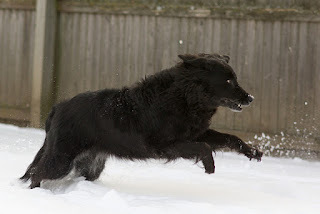 Just the other day she leapt a branch in our backyard like it was a standard agility jump. I keep saying to people “You wouldn’t know anything is wrong with her.” But the reality is there isn’t anything wrong with her anymore. But here’s the somewhat sobering reality: our vet told us that this rarely comes back. We left the vet’s office that day feeling relieved that we may never have to face this down again. But having spoken to many people whose dogs and cats have experienced this has led me to believe that a recurrence is not as uncommon as we were led to believe. So will it ever return? It’s hard to say. Knowing now what I know, I feel more prepared to tackle the disease. But at the same time I sincerely hope we never have to go through this with her again. It has been frightening and frustrating and was simply awful to watch for a time. Dahlia is now about 99% better than she was the day that it started. Hopefully if it ever recurs, she will get back to her usual self as quickly. 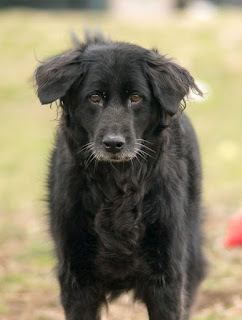 Vestibular Disease in Dogs Support Group. This Facebook group was the main thing that kept me going through the past two months. The people there have all been through it, some are still going through it. New people join all the time (and not just with dogs; there is no equivalent cat group on Facebook so some cat owners have joined this one — Hint to cat owners: Create one! I bet you’d be a great resource for cat owners who didn’t want to post in a dog group!). And many people (including myself) stick around after their dogs have recovered to cheer on and support those who are currently going through it. Lassie, Get Help – Vestibular Disease: Leave a Light On. Besides just the blog post, reading the comments to the post were incredibly helpful. Just seeing that others had been through this and that their dogs were ok made me feel better about the whole thing. Shake, Rattle, and Roll: Top 10 Things You Should Know About Vestibular Disease. This is a great, very informative PDF about the disease. I hope these posts have been informative for anyone who has not experienced this disease and perhaps a comfort to those who have. Please stop in and comment if you wish to. Let us know about your dog’s (or cat’s or rabbit’s) experience with this disease and how they’re doing now!